Shows medial and lateral view of the bones and ligaments of the foot and ankle. Illustrates nerve and blood supply to this region, including plantar view of arteries and nerves. 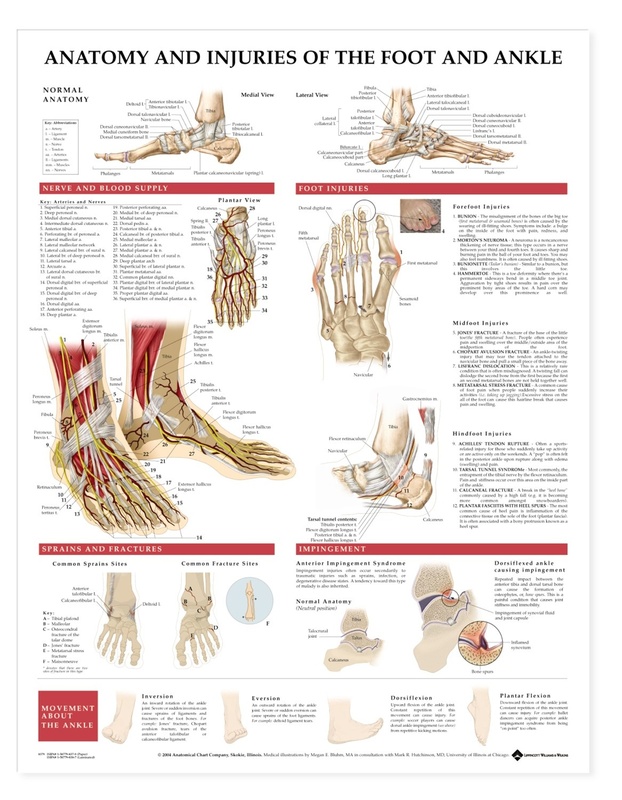 Shows common fractures and sprains and anterior impingement syndrome. 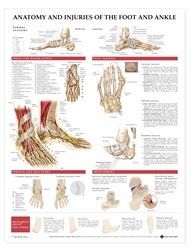 Describes and shows locations of forefoot, midfoot and hindfoot injuries such as: bunions, Morton’s neuroma, bunionette (Tailor’s bunion), hammertoe, Jones’ fracture, Chopart avulsion fracture, Lisfranc dislocation, metatarsal stress fracture, Achilles’ tendon rupture, tarsal tunnel syndrome (which is becoming more common amongst snowboarders), calcaneal fracture and plantar fasciitis with hell spurs. Also visually and textually describes movement about the ankle: inversion, eversion, dorsiflexion, and plantar flexion. I wish I went ahead and ordered the laminated one. If you buy this get the laminated one, it's only 3 dollars more. Trust me it's worth it because the poster will last longer.